The Lynx (Lynx canadensis) is the only cat native to Alaska. Lynx occur over most of northern North America (though their numbers in the northern continental United States have been greatly reduced) and throughout Alaska except the Aleutian islands, Kodiak archipelago, the islands of the Bering Sea and some islands of Prince William Sound and Southeast Alaska. Because they are shy and unobtrusive animals, people think that Lynx are scarce. In Alaska, however, they are commonly seen during long periods of summer daylight, especially during years that they are abundant. 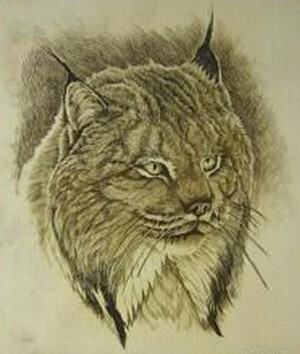 "Link" is a common local name for Lynx in Alaska and the Yukon. The Lynx is a large, short-tailed cat, similar to the bobcat, but distinguished by its long legs, furry feet, the long tufts on the tip of each ear, and a completely black-tipped tail. The large broad feet function as snowshoes to aid the Lynx in winter hunting and traveling. The dense soft fur is buffy grey with indistinct spotting. Most adults weigh from 18 to 30 pounds (8.2-13.6 kg). Male Lynx are generally larger than females and occasionally weigh 40 pounds (18.2 kg) or more. Mating occurs in March and early April and kittens are born about 63 days later under a natural shelter such as a windfallen spruce, a rock ledge, or a log jam. Lynx kittens resemble domestic cats at birth and are buff colored with longitudinal streaking on their backs. Their eyes open about 1 month of age, and they are weaned when 2-3 months old. Most litters include two to four kittens, but sometimes as many as six are born and survive. The production and survival of Lynx kittens is influenced dramatically by cyclic changes in snowshoe hare and other small game populations. When prey are abundant, a high percentage of 1-year old or older female Lynx produce kittens, most of which survive. When prey are scarce, very few yearlings breed, the number of breeding adults declines, and very few kittens survive until winter. The best Lynx habitat in Alaska occurs where fires or other factors create and maintain a mixture of vegetation types with an abundance of early successional growth. This provides the best habitat for snowshoe hares and other small prey of Lynx. The primary prey of Lynx in most areas is the snowshoe hare, which undergoes an 8-11 year cycle of abundance. This cycle appears to be caused by the interaction of hares with their food and predators. Lynx numbers fluctuate with those of hares and other small game, but lag one or two years behind. When a hare population crashes, Lynx numbers soon decline because of the small number of kittens reaching adulthood and the movement of some Lynx out of the area. In recent studies of radio-collared Lynx in Canada, Minnesota, and Alaska, movements of from 100 to 400 miles or more have been documented as Lynx left areas where hares had become scarce. For example, a radio-collared Lynx from the southern Yukon traveled over 400 miles to Chalkyitsik, Alaska. Although snowshoe hares are an important prey for Lynx, when they are scarce Lynx use other food sources more extensively during these periods. Other small prey such as grouse, ptarmigan, squirrels, and microtine rodents are regularly taken. Lynx are also known to prey on caribou, Dall sheep, and foxes, especially during periods of scarcity. Lynx normally travel 1-5 miles per day within home ranges ranging from 5 to more than 100 square miles. The largest ranges occur when prey are scarce. Lynx travel and hunt at a walk most of the time and capture their prey with short bursts of speed. They often ambush hares and other small prey while bedded down near small game trails. Lynx are adept at climbing trees but hunt mainly on the ground, sometimes using trees as a refuge from larger predators such as wolves. Lynx are curious animals and are not difficult to trap using lures made from beaver castor, catnip, or other scents. Visual attractors such as bird wings or aluminum foil are often used to take advantage of the Lynx's visual acuity. Since the early 1970s, Lynx pelts have increased in value and may bring from $200 to $500. Their high value has led to increased trapping pressure and concern among trappers that Lynx harvest should be regulated more closely. As a result, more restrictive seasons have been established in some parts of the state, with the goal of limiting harvest when Lynx productivity and survival are low, thereby maintaining breeding populations that can prosper when prey are again abundant.